2014 Leaf Trinity Football and 2014 Panini Prizm World Cup Soccer made for some excitement for Sports Cards Plus customers last week. 2014 Leaf Trinity Football seems to be in very limited quantities as it seems like every box in our allotment has a #d/25 or less. Out of the first ten boxes sold, we had THREE One of Ones! 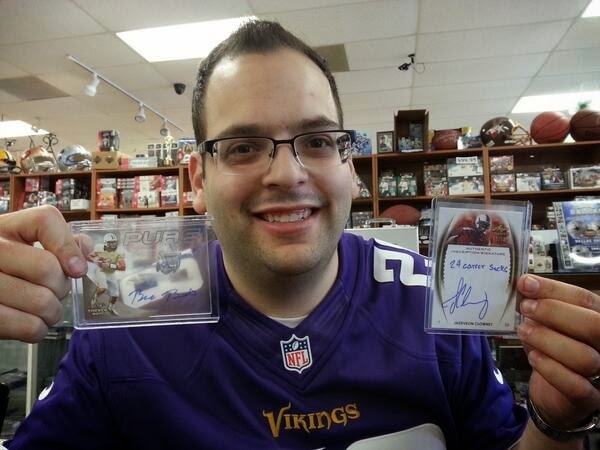 Adam was the first to hit it HUGE with a Jadeveon Clowney Auto Inscription #7/10 and a Pure Glass Blake Bortles Auto. 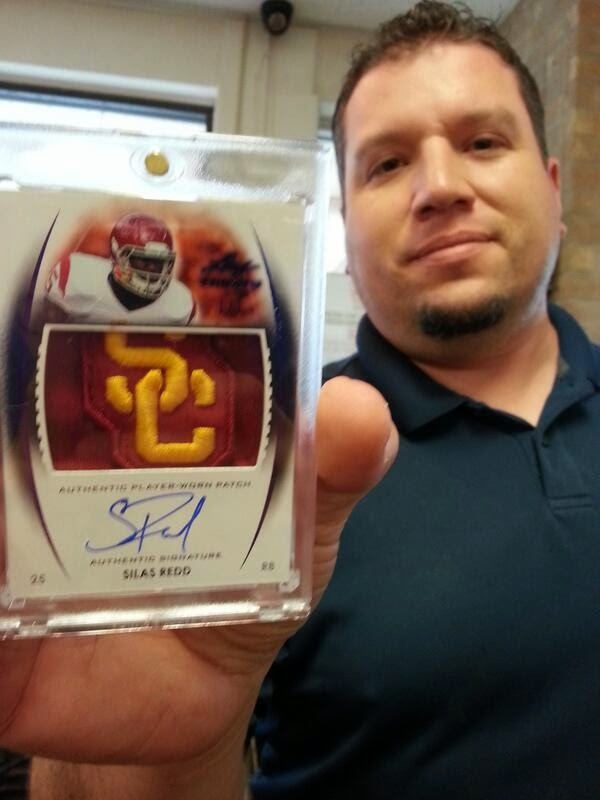 Next Chris came in and pulled this 1/1 Silas Redd Auto Southern Cal Patch. 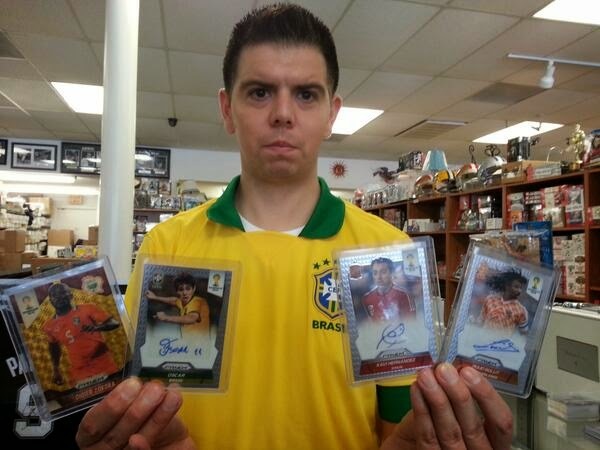 Marcos and friends came in and tried their luck with 2014 Leaf Trinity and 2014 Panini Prizm World Cup Soccer. Their hits included the Johnny Manziel Auto Patch and two low numbered inscription autos. Jay came in and got in on the Super Hit fun. 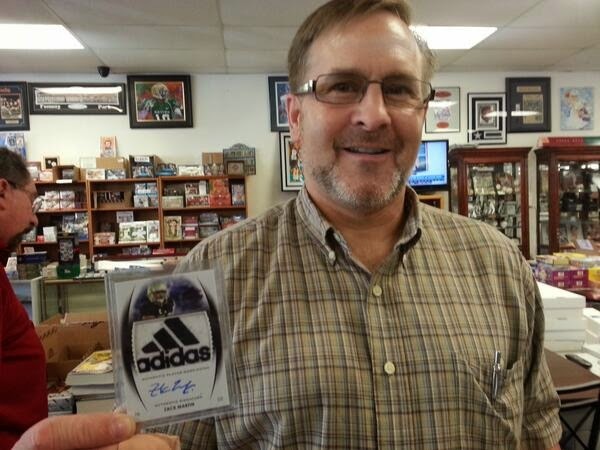 Here is Jay with his Zach Martin Autographed Jersey Adidas Patch 1/1. 2014 Panini Prizm World Cup Soccer is HUGE worldwide. 50 different autographs of soccer stars are selling on eBay for $50 or more. The Messi autograph has sold for $795 with the Prizm version selling for over $1000. 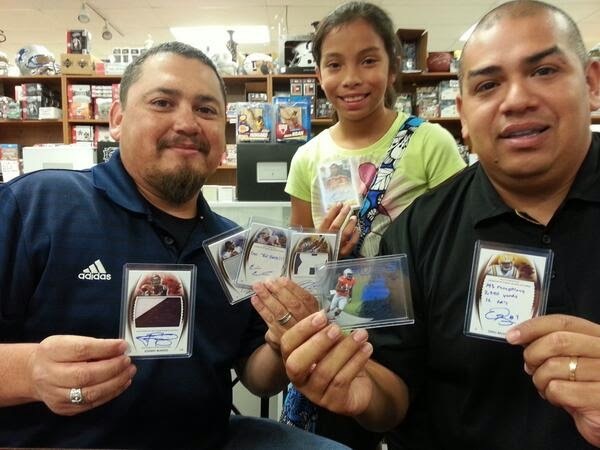 Sports Cards Plus is holding a 2014 Panini Prizm World Cup Soccer Event. 24 Pack Boxes are $108 and packs are $5.99. First one to pull a Baggio Autograph in my store wins $100. Edgar came in and gave it a try. Here is Edgar with THREE Autos and a Gold Power Prizm 5/5, but no Baggio. Come in and give it a try. Get some great cards and you could WIN $100.00 at Sports Cards Plus.